Commander Eisley brings Laurel Yin Qingyu and Violetta Stone out of stasis. The sickly green glow of the stasis chambers provides most of the light in the cavernous hold - they make enough light on their own, little else is really needed. Two hundred and twenty such chambers are scattered about the hold, containing the entirety of the crew when they're in stasis, each roughly the size of a phone booth and cylindrical in shape. While the majority of a stasis chamber is made of metal and contains all of the sensitive equipment needed to sustain the person within, the front is made of a high grade plexiglass that is completely clear, allowing a view of the person inside. One would almost think that they stand upright except that their toes do not touch the ground, instead they float in a greenish liquid that accounts for the color of the light coming out of each unit. The people inside wear only the minimum necessary - a version of tighty whities for the men, and the same plus a halter style top for the women. Numerous tubes and wires are connected to them at points all over their bodies, pumping in and filtering out liquid similar to the kind they float in. One of the elements of stasis involves removing all of the blood from the body and replacing it with a synthetic liquid that preserves the internal organs and bones and prevents the body from aging. The liquid they float in does the same for the skin, muscles and hair. Wires connected to the head and various parts of the body stimulate the muscles and brain to prevent atrophy and to keep the person in a hypnotized state of peace. In addition to the stasis chambers themselves, the hold also contains several control and monitoring stations that allow manual operation of the stasis system when crew members are awake. One door is all that the hold contains, and it leads out to the central corridor of Deck Two. Consciousness comes slowly, starting at the back of the mind and bubbling up like pockets of air in molasses. It seems to take forever. The first sense to come alive is the general sense of awareness, of being present in the here and now - wherever and whenever that maybe. Realization dawns that the body is floating, and the faint prickles of wires disengage in from the body follows shortly after. Warmth begins to flood in as blood returns to the body and synthetic preservative is cycled out. Tubes retract save for those in the nose and mouth that still provide oxygen. Bubbling and hissing fill the ears and the feet gradually touch the bottom of the chamber, the liquid draining away, and soon feet and legs support the body, or at the very least attempt to. Some may find themselves quite shaky despite the regular stimulation of the muscles. When eyes finally open, the world is blurry and vague. One sensation overcomes everything else. Slowly, oh so slowly, Violetta's eyes open for the first time in six years. Her lashes stick a little and she has to blinks a couple of times before she can fully open her eyes to a world that's best described as seen through a fog, "Nick?" Her voice is rough and weak, earning a grimace as she clears it and nearly falls, "I, uh…" She cringes as her stomach complains about being empty, and empty for a while, "Guh…" She sags agains the side of the tube, her hair hanging in her face and dripping on the floor. Her antiseptic surroundings may be all metal and plexiglass, but for the first sixty seconds after Laurel Yin Qingyu wakes, all the woman will see is a concrete building shot through with mold and packed with sweaty, stinking people. A look of sudden panic crosses her sharp features as she mumbles something that would probably be incomprehensible even if it hadn't been in Chinese — and then she sags to her knees, her sticky fingers clawing for purchase against the cold deck, her long black hair clinging to a throat that bobs up and down and up again with every breath she takes. How fortunate that the subtly stabbing pangs of hunger thrumming through her body are enough to force her back to the land of the aware, albeit with a few more whimpers than she'd likely prefer. One of the first things the average person becomes aware of upon waking up - besides that awful hunger - is the fact that most of the stasis pods are sealed. Bodies hang suspended in green gel, luminous and still; where pods are empty there are shadows, hollow tubes whose contents are missing; at this point one in ten pods is vacant, a strange count to be certain. This lacks both the commotion of a catastrophe and the chaos of a staggered release, particularly since there is but one person on hand to offer greeting: Commander Eisley stands some distance from the pods, surely to avoid splashes of both goo and bile, given that retching upon hitting the deck is a common outcome. Though pressed, polished, and in full uniform, she carries a pair of towels draped over one arm, and it is these that are offered along with a greeting. "Good morning, ladies." The sound of another person's voice has Violetta prying her eyes open again and reaching up with a shakey hand to push her hair out of her face. She looks like she could, quite easily, lose the liquid contents of her stomach, swallowing hard several times to keep from heaving all over the floor. Slowly she straightens and manages a salute without falling on her face, "Ma'am…" She makes a small whimper as another hunger pang tightens around her middle, "Are we there yet?" There's the faintest hint of a whine in her voice as she asks the question. When she stands on shaky knees, the streams of viscous fluid dripping down Yin's body resolve into little beads of goop too stubborn to fall to the ground. Dressed in briefs and a halter top that's just shy of being too immodest for her tastes, the willowy woman looks rather like she's just finished a long and exhausting run — an image reinforced when an unsteady hand reaches out for the towel she's been offered. "Hai Jun Zhong Xiao," the petty officer rasps, wiping down her body with slow and deliberate steps. And then, almost as an afterthought: "I — I mean." You've got to give her credit for at least trying to salute before she tumbles back to the ground, her knees and elbows taking the brunt of the impact. "Sorry, Commander." Her lilting accent is evident even through the phlegm and bile gathering at the back of her mouth. "It's all right," the XO is quick to assure. Almost uncharacteristically, but having gone through this same process herself she surely must know almost exactly how awful it feels. She comes bearing gifts, and offers one towel to each of the newly wakened. Alas, there is little warmth in this, and that is all the welcome that Eisley can give. "As you are bound to discover very quickly, we are not in orbit around New Eden. There have been some… developments. Report to my office in two hours for debriefing; in the meantime, find your quarters. Shower, dress, eat." Violetta gives the XO a grateful little smile when the towel is offered, haltingly talking it so that she can start to dry off a little, "Devlopements?" Her voice starts to clear a little as she uses it more, "We're not?" She blinks a couple of times, wiping goo off of her cheek and neck, and frowns. She opens her mouth to ask another question, but is stopped when another wave of nausia and hunger grabs her, her voice devolving into another little whimper. Instead she nods at the order to report for debriefing and forces herself to stand, "Yes, Commander." That comes out sounding vaguely human. Thin fingers ball up into fists as Yin wipes her lips with the back of her hand. Unfortunately for her, she doesn't seal her lips tightly enough — and when she gets a taste of the preservative in which she's been frozen, she succumbs to the queasiness that's been nibbling at the edges of her resolve all throughout Eisley's speech. The Commander might recognize that vaguely pleading look in her eyes — look away — before she nods once in acknowledgment, shudders from head to toe, and begins the arduous process of losing her proverbial lunch. Thank heavens she's got two hours. Every good office is dominated by a desk and this one is no exception. The XO's desk is almost eight feet across, half that in width, a sheet of black glass that shimmers through with motes of color. Bits of it light up as needed, becoming brilliant controls that respond to a touch and then fade into nothing when not. Behind it sits a high-backed chair, sleek and black. Behind that is a plasma screen that occupies almost the entire wall, pretending to be a window that looks out into space when not otherwise in use. In front of the desk are two smaller chairs, also black though not as imposing. Black is a theme here; there is also a sleek black sofa set against one wall, ruining the perfect linear symmetry of the room. It matches the charcoal color of the carpet, and imposes in hard lines against the ivory walls. The last two hours may have been a fairly surreal experience. There are only about 20 personnel awake on the -whole ship- and at this hour many of them are at duty stations. Because most of the ship's systems - notably including the mess - are automated, the chances of running into another living person are actually fairly slim right now. At least there are no lines in the chow hall, nor waits for the lifts..! Anyway. Commander Eisley's office is very easy to find. She is, as promised, here at the allotted hour, seated behind that big glass desk. Behind her, the plasma screen that pretends to be a window is filled up with an image of the Cat's Eye Nebula, the death of the star at its heart measured in convulsions of dust and gas that form strangely precise concentric rings around an ellipse of blue-white flame. Just now she is reading something off a data pad set on the desk in front of her. When the door to the Commander's office slides open, it's not 'Laurel' or 'Qingyu' or 'That girl who retched all over the deck' who steps inside but a non-commissioned officer in the Earth Alliance. "Sir," says the woman, snapping to attention. Sure she looks a bit uncomfortable in the skin-tight jumpsuit that serves as her uniform, and sure the makeup she's applied to lend color to her cheeks is just a little too thick for good taste. But all in all? What a difference two hours and three plates of food can make. 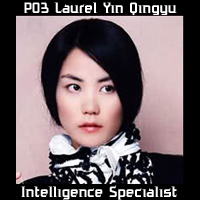 "Intelligence Specialist Third Class Yin, reporting for duty." Now worried that there's something seriously wrong, Violetta forced herself to take her time eating and ate her fill. She's clean, dry, and dressed in a crisp uniform as she arrives with Yin. Her own makeup is a little lighter, but her hair has been arranged just so in a tumble of loose curls around her shoulders, "Seaman Apprentice Stone, reporting as well, sir." Sure, her entrance has been upstaged a little by the other woman, but she still stands at attention and waits for the invitation to enter. "Come in," says the XO, setting down her datapad and gesturing at the chairs on the other side of her desk. "Have a seat." 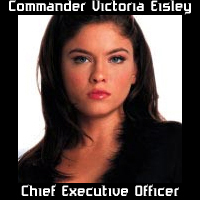 Any past experience with Commander Eisley supports the idea that the woman is calm and somewhat cool; there have even been rumors that she has titanium rods sewn into the backs of her uniforms. Under the circumstances, however, she is more serene than cold, more thoughtful than starched and stiffly pressed. "I am quite certain you have both deduced that something is amiss. We are not in orbit around New Eden, and it is 2128, not 2132," which was the projected time of arrival at that planet. Laurel's rarely 'at ease'; rather, she's just varying degrees of taut. Her hands clasped behind her back, her feet level with her shoulders, she wouldn't look terribly out of place guarding that great mausoleum in Tiananmen Square — that is, until she's told to sit down. She tumbles into a chair with precious little grace, her boots tapping an unhappy cadence on the deck as she tries to figure out how to sit at attention. Soon enough, though, Yin has settled in, crossing her legs and folding her hands across her thigh. A willing sponge for information, she. Violetta's expression is carefully blank as she walks in and lowers herself into one of the chairs. The very tip of her tongue is visible for a moment as she licks her lips at the mention of the year, her eyes widening a little as she shifts a little, her earlier nausia threatening to return at the thought of something being really wrong! She takes a deep breath and nods once, willing to sit and listen to find out exactly what's happened fo have them brought out of stasis four years too early. Eisley settles her forearms on those of her chair, hands curling over the ends just tightly enough that her knuckles whiten, this just visible through the plane of black glass that serves as her desktop. "Some four weeks ago, the senior crew was brought out of stasis on one of the ship's pre-programmed emergency plans. Her sensors had picked up a signal from a small ship of Giver origin, which had naught on it but a message: an apology for us, on behalf of those who had, assumably, been our benevolent sponsors. They were in fact a race hunted nearly to extinction by another spacefaring species that they called Devourers. In an act of desperation, they attempted to trade the lives of the last of their kind for the location of an overpopulated planet full of another race bent on rapid self-destruction. No sooner had they done this than, out of guilt, they sent a transmission to Earth to warn us of what was to come." These words are recounted slowly, with a calm, grim formality. If there is no apparent emotional investment in them, it is because the ache has dulled over time, and maybe through repetition. Clearly this is not the first time she has explained this, and with over a hundred thousand people still in stasis, it will not be the last. They don't teach you the right words for this sort of thing at night school, and so it is that Yin's lips open ever so slightly before she has the presence of mind to slam them shut. Don't waste time trying to chase down the English lessons now scurrying into the far corners of that brain. Just stay impassive, and try your hardest to fend off that terrible mute despair that comes when faced with an inevitable thing. "I… Is there something wrong with the computers?" Violetta had a hand in their design, after all, "Maybe there's been some kind of glitch." It's a weak hope, but the young woman clings to it like a lifeline. Clearly she wasn't prepared for news like this. "I am afraid, Seaman Stone, that there was no technical malfunction. About 48 hours later we received a second transmission -from- Earth, sent in July of 2124." Eisley inhales for a moment, and for that moment closes her eyes. No, this does not get easier in the telling. "Our far watchposts on Jupiter and Saturn fell first. Then Mars, then the Moon." What more needs to be said about that? "A second ship, one tenth the size of the Genesis, was launched then, in hopes of piercing the blockade and saving a few more, but we have no information about its status and no way to contact it. We have received no more messages from Earth." "They gave this ship weapons," Yin observes dully. Her thin soprano wavers as her knuckles turn white, the fingers on her left hand gripped tightly around the palm of her right. Despite herself, the woman sways forward in her chair. "I — I had wondered about that." Well, that's one answered question she can tick off the list. Breath catching in her throat, Violetta's hands tighten into fists on her thighs and she swallows hard. Clearly, she wasn't prepared for such bad news. She licks her lips again, suddenly very pale under her mask of makeup, and takes a deep breath, "We're… it?" All that's left of humanity? She closes her eyes for a moment, hands trembling a little, "But… We're all alright, right, sir?" Meaning: There haven't been any casualties onboard yet. Eisley looks back and forth between the pair, still exceptionally serene. "They gave us everything they had in hopes that we would use it to save ourselves. Sadly, they decided to build up Earth's defenses instead of investing in ships. The Genesis is fine," she goes on, changing subjects to answer the other question. "The New Eden site is believed to be compromised. The Givers made several suggestions for alternatives, including the one that Captain Ramesh has chosen for us to pursue. Our mission remains the same: to find a suitable place for colonization, and to ensure that our cargo," the last remnants of humanity, "is delivered and establishes safely. In a day or so, we will reach a wormhole that was known to them and begin preparation to go through it." Yin's silent for a long while as she shifts in her chair. Almost by rote, she smoothes out imaginary wrinkles on the skin of her uniform, pausing only to pick at nonexistent grains of dust. Maybe she's trying to reconcile herself to the fact that humanity's been reduced to a hundred thousand souls and change. Maybe she's just trying to figure out what the word 'wormhole' means. Then, finally: "Okay." Violetta relaxes slightly when she hears that there hasn't been any kind of accident with any of the crew or 'cargo' and nods. At least her brother is fine, even if their parents are likely gone. Gone… There's the beginning of a twinge at that thought, but it's pushed away to be processed later. She nods, content that there's a plan and it's being followed, "Yes, sir. I understand." The change in her posture might be noticable: She trusts that the captain will see to their safe arrival wherever they end up. There is another beat of silence, like a kind of awful punctuation. Then Eisley adds, "These transmissions are archived in the ship's database; you may view them at your leisure, if you desire. In the meantime, you both have 48 hours of light duty leave before you are expected to report to your stations." 48 hours is, perhaps, not a long time in which to come to terms with this news, but likely it is all that can be spared. "Okay," says Yin once more. It is, after all, a comfortable word. "I — " The woman covers her mouth while she clears her throat. Despite a hot shower and a full ten minutes spent brushing her teeth, the bitter taste of that preservative lingers on. Best to avoid any unfortunate accidents. "I would like to also see everything we know of the enemy and his technologies. Capabilities. Communications protocols. Even, perhaps, his works of culture." She has more — but she falters. "If we have any of that," Laurel amends. "Which we probably do not." "Thank you, sir." Two days is certainly longer than Violetta would have expected to have before being required to report. She shifts a little in her chair, "Can you tell me, Commander, if Seaman Apprentice Nicolas Stone has been revived?" She pauses, flushing slightly, "I can look up the information myself, if you'd rather…" Eisley might not, after all, know the name of everyone that's been brought out of stasis. Eisley finally lets go of the arms of her chair, but only to draw her hands together. All but her index fingers tangle; those form a single-spired steeple over which she studies the others. To Yin she nods, but once. "What information we have is in the database; you can peruse it as well at your leisure." Violetta as well gets a single nod. "Your brother was brought out of stasis a few days ago. If you have no further questions, you may both be dismissed." "Sir." At least Yin goes about standing a lot less awkwardly than she goes about sitting. With another salute — and a wordless look at the girl beside her, one that speaks almost to … envy? — she makes her way out the hatch. Only when she's sure nobody's watching does she slam a boot against the wall so hard she almost crushes her toes. Violetta nods and rises, smoothing her hands over her uniform, "Thank you, sir." She flashes a little smile, one that doesn't quite reach her eyes, and snaps a salute before turning and striding out the door. She pauses for a moment when she sees Yin in the hall, giving the other woman a concerned look, but has a goal in trying to find the sole remaining family member, so only pauses for a moment, "Hey… You alright?" Aside from learning that they're all likely all that's left of the human race. "I will be fine, Seaman," Yin snaps with more venom than she perhaps intends. "Carry on." And pay no mind to the fact that she's favoring her right foot over her left, or to the fact that she's leaning against the bulkhead for support.